ERUDITE COLLECTION: Erudite is for words that are skilled and studied, not simply written. Masterfully crafted with a devotion to centuries of craftsmanship, a design-led writing instrument. With a geometric finish for a modern-world touch - an ultimate maker of moments, don't simply write, create. EXECUTIVE ELEGANCE -With its smooth, gliding refined nib, you have a creative channel from mind to hand. Effortlessly take the whirlwind of life, serenely organizing it as written moments never to be lost. When writing flows naturally, amazing things happen. ERGONOMIC DESIGN TECHNOLOGY - Get up close and personal with the sleek, ergonomic design of Wordsworth & Black's Erudite Fountain Pen - designed with you in mind. Crafted to liberate your creativity - a delicate weight to comfort ratio to suit both Left and Right handed writers. 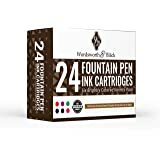 MEDIUM NIB, LUXURY GIFT CASE, FREE CONVERTER and FREE INK CARTRIDGES - For the unforgettable gift of writing experience of an ageless era, with the customary smooth precision of Wordsworth & Black. This is not a pen; it is a writing instrument that is a steal for the price. 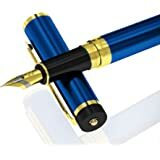 I received mine approximately two hours ago and began to write with it immediately since other reviewers raved about this pen, except one. It comes only with a converter and no ink cartridge. This is not a big deal for me since I have several ink cartridges. It was easy an easy fill from a bottle of Pilot Iroshizku purple. I turned the converter clockwise just a tad until I saw ink in the feeder. This pen writes as well as my FPs costing several hundred dollars more. It comes in a leather box with nice felt inside. 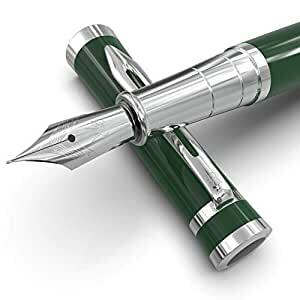 The pen barrel and cap are made of finely polished steel that looks elegant. The barrel has a black and white cross hatch pattern that is made of some other material. I'm sure with use it will peel over time. I compared it to a Mont Blanc PIC rollerball that I bought and sent back. The cap had a cheap plastic ring that began peeling and the resin started fading after ONLY A WEEK OF USE. Bottom line, this is a an elegant looking writing instrument that writes well. As for the rollerball. It comes with a no name cartridge but it's size and design parallels the ones from Monteverde. I'll have to check that out. The only very minor complaint I have about this product is that removal and insertion of the caps is a little stiff. Really?! It's pretty intuitive if you're familiar with FPs. The company sent me an e-mail explaining why the unit does not come with an ink cartridge and to contact them if I had any questions. I thought that was great customer service. 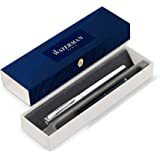 5.0 out of 5 starsBeautiful pen! 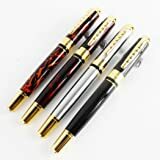 I'm a recent convert to fountain pens and I've been trying to find pens that are comfortable, write well, and are inexpensive. This pen fit all my requirements, and I can't lie, the fact that it is Slytherin green really caught my attention. This pen feels nice in your fingers and isn't too heavy even with the cap stuck on it when writing. The cap is secure and stays on well if you like to write with it on the upper end of the pen. It came with a refillable ink cartridge which I have not tried as well as a box of six disposable cartridges. The presentation box it came in is really nice as I show in the pictures. I had no issues putting a standard disposable ink cartridge in it and it took no effort to get the ink flowing properly that first time nor in the next four (I'm on my fifth cartridge). It writes smoothly as I show in the photo - please forgive my horrendous handwriting. And as a point of information I'm left handed and have no issues with the nib (something I have battled with a couple of pens in the past). Overall as an initial review I am very happy with this purchase and would recommend to anyone like me just starting out with fountain pens. Will update if that opinion changes. This pen set is gorgeous. It is the perfect gift for anyone that is sophisticated and elegant! It is simply a must have if you enjoy receiving compliments from people. Customer service is phenomenal, this is a common characteristics of companies that value their customers. I can already picture this brand at a higher level next to Parker, Cross, Aurora and maybe one day competing side by side with Montblanc! I will definitely purchase more of their pens and will recommend other people to try them. Slim, metal bodied pen, suited for the female hand. It goes right to work even after sitting inked for three days--a feature I love. 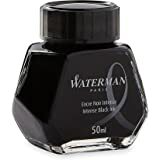 It's a wet writer so you might prefer a quick-drying ink in this one. The pink is deeper than shown in seller's pic, fwiw; the color makes for it being easy to find. :) It has nice weight and, while not terrible to use posted, it's perfect left uncapped. This pen comes with an at least decent converter. It writes medium to bold. I could be convinced that this fountain pen comes from the makers of the Hero line of pens. Speaking of the cap, there' s something I really dislike about this pen. It doesn't affect the usefulness of this "Opulent Pink Chrome Trim Fountain Pen by Wordsworth & Bläck" but bothers me still--there's none of this trim on the open end of this cap; there's just the unadorned edge, and that's the primary cause of no five stars from this reviewer. Although it feels relatively raw, it's not raw in a way that'll hurt anybody. If you are in the market for a pink budget pen, I could heartily recommend. Everything about this product is beautiful. The 2 pens and even the case are all splendid. Highly recommend for the price!